Serve up a scary supper before you head out trick or treating. 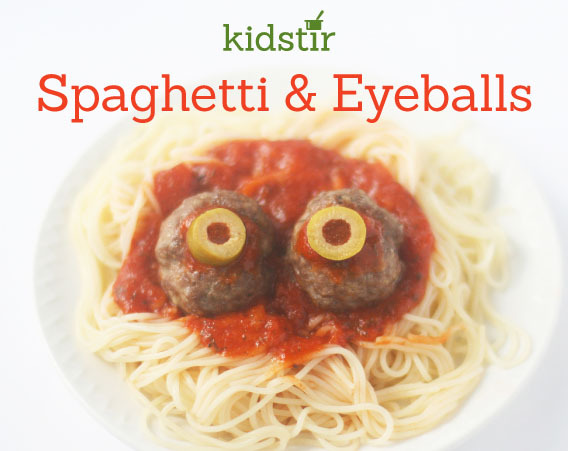 Make meatballs with olive eyeballs—and top on spaghetti. 1. Put the ground beef into a large bowl. Add the bread crumbs, Parmesan, garlic, basil, oregano, and salt. Add the beaten egg, then mix it all up with a spoon. 2. Now make the meatballs. Roll them into 1-inch balls (you should get about 12). Place on a baking sheet. Flatten slightly with your hands. 3. Preheat the oven to 350°. Bake the meatballs for 15 minutes, turning once during the baking time, until they are brown and the centers are no longer pink. 4. Serve up plates of the cooked spaghetti with warm pasta sauce. Add two meatballs to each serving. For the eyes, put a dab of extra sauce on each meatball, then top with an olive slice.